Since the day they met, Owen’s restraint has been an exciting foil to Caleb’s unruly lack of discipline. Now established lovers, they can’t deny how welcome that balance is in their lives. Two very different men, both strong-willed—it shouldn’t work between them, but it does! Owen’s steady world is rocked by Caleb’s boldness, and Caleb finds a haven in return. Now they share their lives, a strong need for each other and a highly developed love of play. On this weary night at the end of a working week, they’re caught in traffic on opposite sides of town. They’ll have to wait until the journey’s over to meet up and enjoy the evening together. 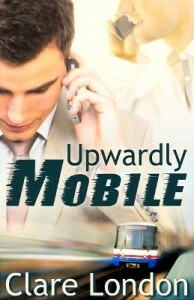 Caleb decides he won’t wait to play, and he’ll play as dirty as he dares—or as much as they can handle over the phone. Caleb sighed happily. In complete contrast to his lover, he felt increasingly relaxed. The car heater was on and the windows were slightly steamed. He was protected from the foul weather outside, also the noise and hassle of city life. Work had been tedious this week, but now it was over for another couple of days. Okay, so Owen was still miles away, but Caleb had an intriguing alternative. His guy’s voice was pitched at just the right level, irritated yet curious, too. Just at that cusp between fury and fascination. Could go either way, Caleb knew from experience. That was what made the game all the more delicious. He felt…yeah. Provocative. Owen cursed under his breath, but Caleb caught most of the words he used. Owen had an impressively imaginative vocabulary when he chose to swear. Sounded like he touched on plenty of things that were currently coloring Caleb’s own imagination. “Uh-huh.” He could hear Owen’s hesitation; could hear the catch in his breath when surrender started to win over self-possession. That exact moment was as sweet as any pie they’d ever shared since that first night. I’m looking for a copy of this book, but no one seems to carry it. Please help.